Samantha is the historical character from American Girl who grew up at the turn of the 20th century at the height of the Victorian era. Unscramble these words from her world. If you get stuck, visit Samantha’s page AmericanGirl.com for clues. 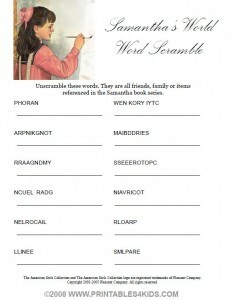 Click on the image above to view and print the word scramble full size or download Samantha’™s World Word Scramble as a PDF file. Looking for more printable American Girl activities? Here are some more from my collection. While Samantha’s collection has been archived from American Girl, her stories and characters live on in books! I love American Girl dolls and these activities!